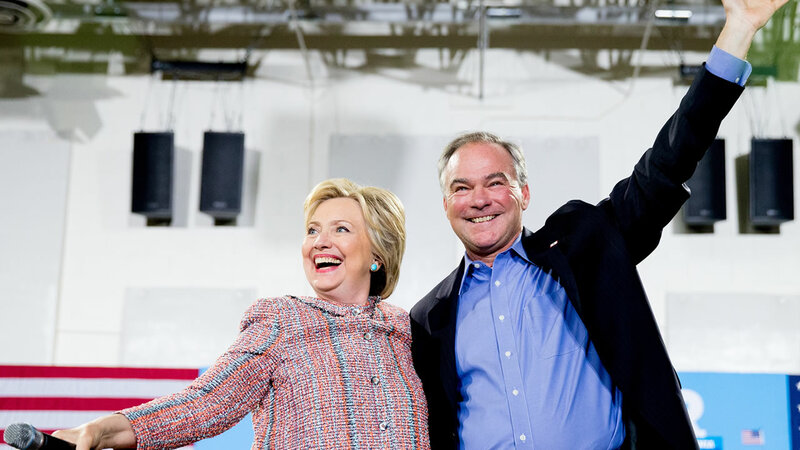 WASHINGTON -- Hillary Clinton named Virginia Sen. Tim Kaine as her vice presidential running mate Friday, adding a centrist former governor of a crucial battleground state to the Democratic ticket. Clinton called Kaine by phone around 7:30 p.m. Friday to offer him the job, and he accepted, according to a campaign aide. She then called President Barack Obama to inform him of the decision. Kaine, 58, had long been a favorite for Clinton's ticket. Active in the Senate on foreign relations and military affairs, he built a reputation for working across the aisle as Virginia's governor and as mayor of Richmond. He's also fluent in Spanish, making him a valuable asset in Spanish-language media as the campaign appeals to Hispanic Americans turned off by Trump's harsh rhetoric about immigrants. Clinton weighed two finalists: Kaine and Agriculture Secretary Tom Vilsack, a longtime friend of the candidate and former President Bill Clinton. Kaine's strong ties to politically important Virginia, as well as his foreign policy experience, put him over the top, according to a person close to the campaign, who insisted on anonymity because the person was not authorized to discuss the process publicly. Kaine and Vilsack each had friends and allies lobbying the Clinton campaign on their behalf. But Kaine had a particularly powerful backer: Obama, who told the campaign during the selection process that the senator would be a strong choose. Kaine is viewed skeptically by some liberals in the Democratic Party, who dislike his support of free trade and Wall Street. Shortly after Friday's announcement, Stephanie Taylor of the Progressive Change Campaign Committee said Kaine's support for the Trans-Pacific Partnership trade pact gives Republicans "a new opening to attack Democrats on this economic populist issue." Clinton's campaign closely guarded the selection process, keeping the names of finalists under wraps to try to maximize the impact of the announcement. Clinton held two lengthy private meetings with Kaine, including a lunch at her New York home last Saturday with their spouses and children. Clinton's campaign teased the announcement throughout Friday, encouraging supporters to sign up for a text message alert to get the news - a favorite campaign method for getting contact information about voters. The Democratic candidate made no mention of her impending pick during a somber meeting with community leaders and family members affected by the Pulse nightclub shooting in Orlando and a later campaign rally in Tampa. As Clinton finalized her decision, Trump met with supporters in Cleveland to run through a long list of thank-yous after his four-day convention. Trump boasted of his TV ratings, his primary victories and other achievements, including winning over his wife, Melania, in a stream-of-consciousness delivery with Pence, standing quietly nearby. "I don't do anything unless I win," Trump insisted. He promised to work "so hard" as the nominee and vowed his campaign was "not going to disappear," even though he has no plans to campaign this weekend. No matter, perhaps, as that time will belong to Clinton and the Democrats, whose own convention begins Monday in Philadelphia. Kaine is expected to speak Wednesday, with Clinton delivering the closing address the following night. Before entering politics, Kaine was an attorney who specialized in civil rights and fair housing. He learned Spanish during a mission trip to Honduras while in law school. During his political career, he's demonstrated an ability to woo voters across party lines, winning his 2006 gubernatorial race with support in both Democratic strongholds and traditionally Republican strongholds. Some Democrats believe Trump's selection of Pence, a conservative white man from a largely Republican state, freed Clinton from pressure to add another woman or a minority to her ticket. Her short list included Massachusetts Sen. Elizabeth Warren, two Latino cabinet secretaries and New Jersey Sen. Cory Booker, one of two black U.S. senators. Democrats argue that Kaine can help her woo moderate and even some Republican voters turned off by Trump's provocative rhetoric.